"Now what do I do?" You know the feeling, when you invite people for an impromptu Happy Hour before checking the pantry or fridge. 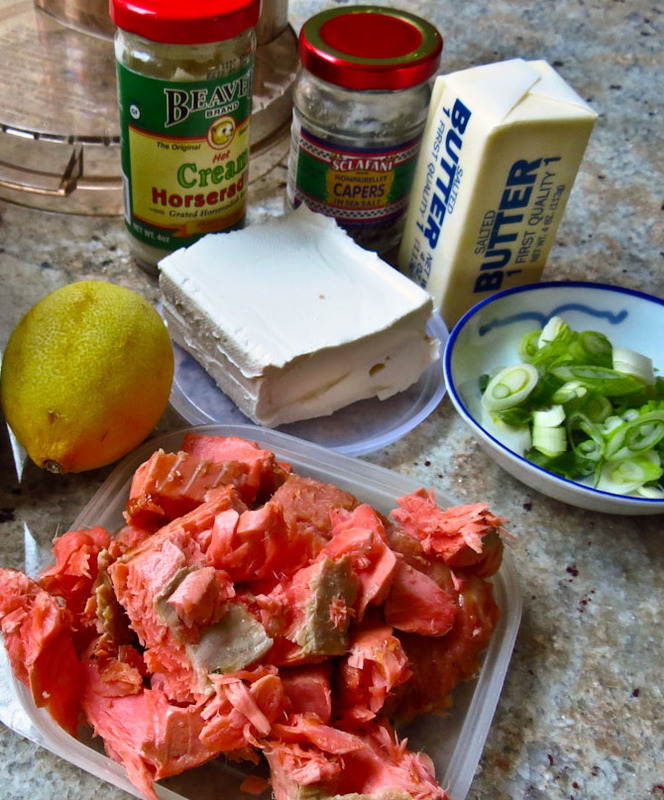 I can't tell you how often Salmon Spread has come to the rescue, whether we're on the boat or home ashore. Leftover grilled or baked salmon, or even canned salmon transforms quickly into a delicious and popular topping for crackers, crostini or raw vegetables. This week we're onboard and I pulled a piece of steelhead from the freezer for our dinner (Herb-crusted Steelhead link) and an extra fillet for some salmon spread - planning ahead for a change! The recipe flexes easily to handle substitutions of ingredients or quantity adjustments. No butter? no problem, just leave it out. No cream cheese? same answer, though I've never omitted both cream cheese and butter at the same time. Don't care for horseradish? 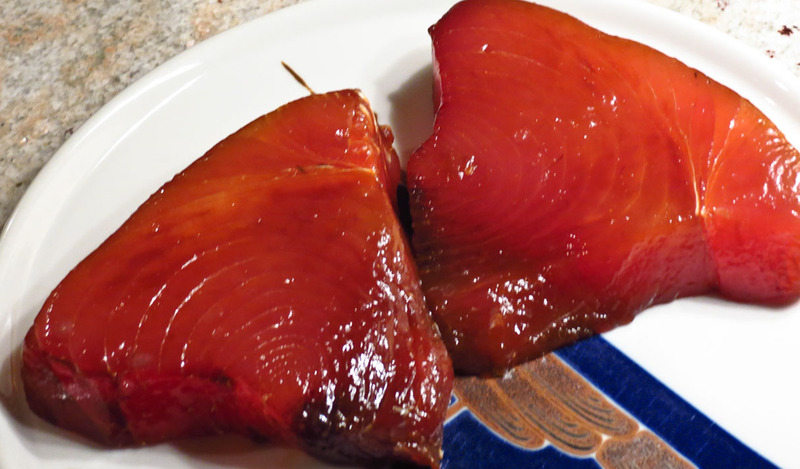 substitute hot sauce, chipotle or wasabi mayonnaise or a few drops of liquid smoke for a flavor pop. Not a fan of capers? try adding chopped pistachios for an unexpected change. Don't have a food processor or blender? okay, just use a sturdy fork and a bit of muscle. No fresh veggies or crackers? 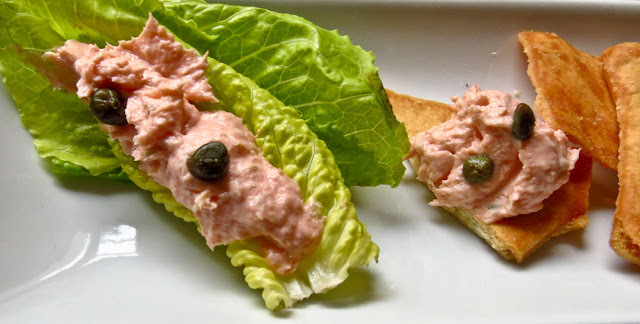 smear some salmon spread over a soft flour tortilla, roll up tightly, use toothpicks to hold it together and slice off inch-wide pinwheels, each piece held together with its own toothpick for easy serving. 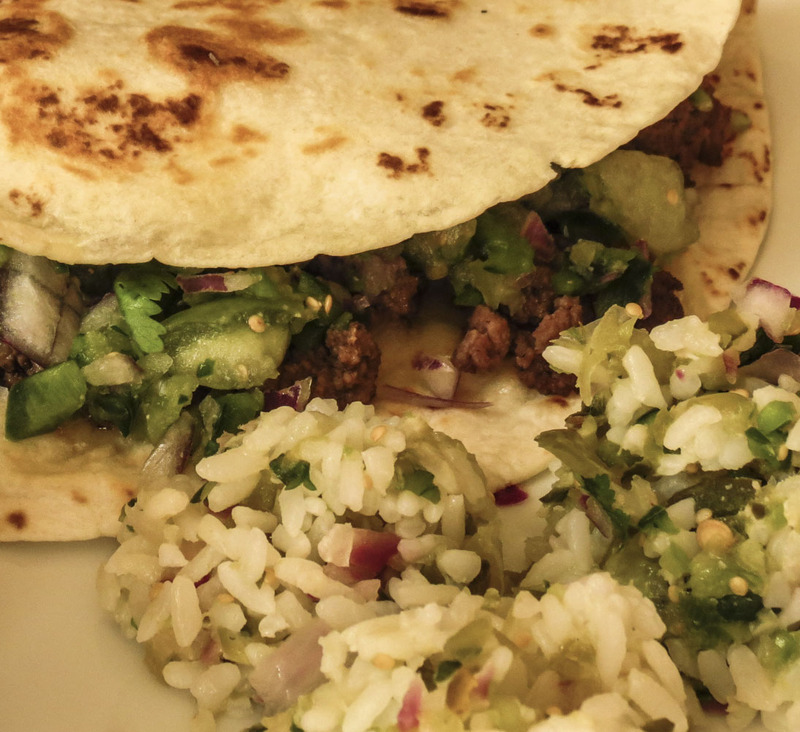 Leftovers have never been so tasty, so versatile or such crowd pleasers! Blend salmon, lemon juice, cream cheese and horseradish sauce in a food processor. With the motor running, pour in the butter in a steady stream. Fold in the sour cream, green onions, capers and dill. Taste and adjust seasonings, adding Tabasco, salt and pepper as desired. Pour into a serving dish and refrigerate until set. Serve with crackers, lettuce leaves or cucumber rounds, or (no more than an hour ahead) fill toasted wonton cups for a fancy presentation. Note: for a smokey flavor you could add a dash of Liquid Smoke, as several recipes recommend, but I'm not fond of the back flavor. I think it tastes a bit like kerosene smells -- but that's just me. I first tasted a tangy tomatillo salsa over 15 years ago at a cooking class in Albuquerque, New Mexico and it's been a favorite of mine ever since. It isn't a unique condiment, newly-foodie or even a weird recipe. You can find thousands of recipes online (try a Google search and check it out). AmateurGourmet posted his smooth version in January, Rick Bayless's pureed version is referenced in scads of blogs. Why bother with this post? Just because it's just a darned good salsa and I made a large batch. Warning! 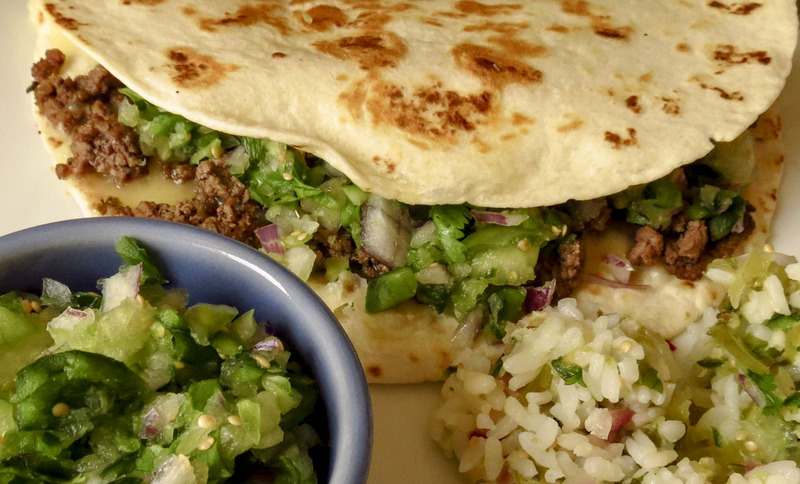 Don't bother making this with canned tomatillos, they just won't work! There's a tinny, canned, not-so-pleasant taste and slippery-almost-slimey texture that comes along with the canned version. Ugggggh. Okay, I can stop now, that's out of the way. The salsa is a terrific stand-alone condiment to enjoy with chips, or to add to tacos, quesadillas, omelets, hamburgers, hot dogs, corn salad, tortilla soup, black bean soup, guacamole, dips, or even stir into a bowl of cooked rice or beans. 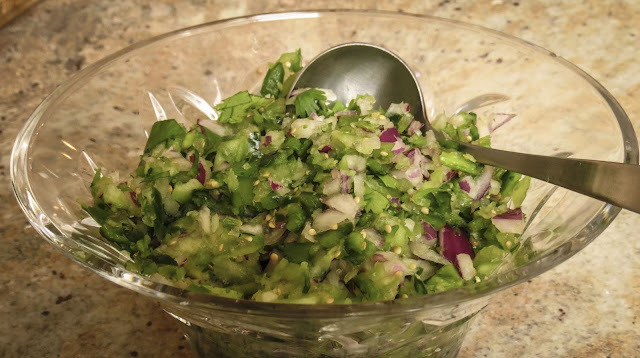 Use a food processor or coarsely chop the ingredients by hand, either way this salsa is a quick prep. Add a little sour cream and mayonnaise for a creamy, slightly tamer version if you prefer. Add some chopped avocado for an extra bit of deliciousness. Chop, blend and season a batch of Tomatillo Salsa Fresca soon - it won't change your life but I'll bet you'll enjoy the fresh, tangy taste. Process tomatillos, poblano and red onion separately in food processor until coarsely chopped (but not pureed!) Add to a medium-sized bowl, draining off most of the tomatillo liquid. Add remaining ingredients and mix thoroughly. Let sit 10 or 15 minutes, then taste and adjust seasonings as necessary. Too tart? ad a bit of sugar. Too bland? add more salt and some hot sauce. Too spicy hot from the poblanos? 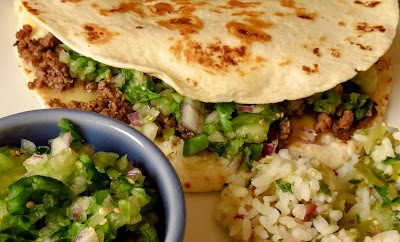 add a little sour cream and mayonnaise, but not too much or you'll have a sandwich spread instead of a salsa. 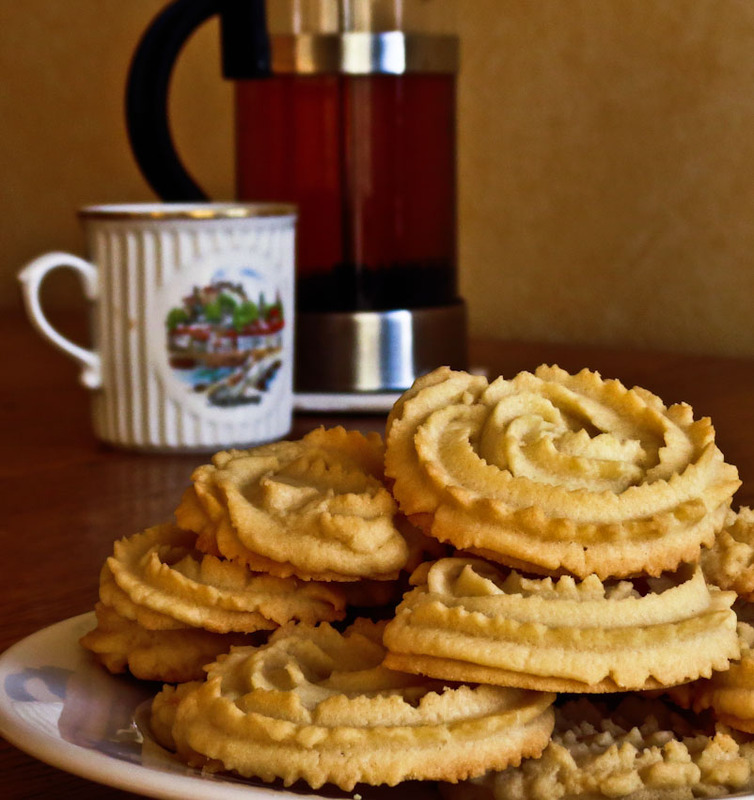 It's January, so what's up with a Christmas cookie recipe? It is traditional to associate Spritz with holiday cookie madness, but this batch of Spritz was more medicinal than festive. RL was hit with a nasty flu bug, lost all interest in food and did a Rip Van Winkle for over a week. The only food to tempt him turned out to be cookies, and only Spritz cookies would do. Myself, I typically turn to canned peaches or mashed potatoes when I'm in flu-recovery mode, but the man loves his Spritz cookies. This cookie classic has been a favorite for generations and has countless variations; lemon spritz, orange spritz, chocolate spritz, cream cheese spritz... the list goes on. I used the oldest, butteriest recipe I could find, a simple one clipped long ago from Gourmet Magazine, rather than playing with a tempting, flavored version. Change can wait, wait until some time when food therapy isn't so important. But do check out some of the Spritz recipes on the Wilton site (link), or this fancy chocolate-dipped pistachio sprinkled Spritz from Epicurious (link). Of course you can make Spritz cookies by forming walnut-sized balls and flattening them with a fork until about 1/2-inch thick. 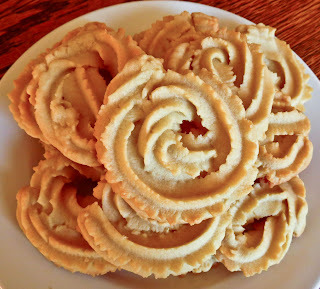 But according to the husband, real Spritz cookies must be shaped with a cookie press, like he and his mother made them all those years ago. It was worth fiddling around with the old press, actually kind of fun, though a powered press would be heavenly if I made Spritz cookies very often. Considering how fast the cookies have disappeared, I might have to bake again soon. Oops, did I just admit publicly to eating w-a-y too many of these myself?! 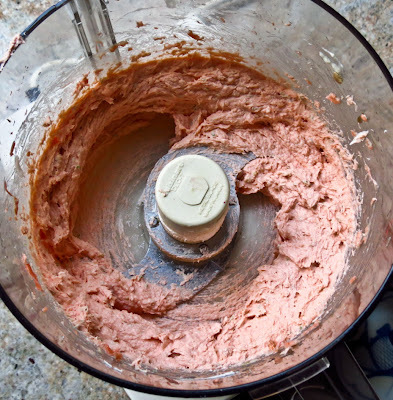 In the large bowl of a stand mixer, cream the butter; beat in the sugar, a little at a time. Add the vanilla and the almond extract; beat the mixture until it is light and fluffy. Add the egg and combine the mixture well. Add the salt and the flour mixture all at once and combine the dough well. Use a cookie press and star disc to form cookie rounds (or choose other disc and shapes); arrange an inch or two inche apart on ungreased baking sheets. Bake the cookies in a preheated moderate oven (350° F.) for 10 to 15 minutes, or until lightly golden around the edges, being careful not to overbake; transfer them with a spatula to racks to cool. Store the cookies in airtight containers. Makes about 6 dozen cookies, depending on shape and size. 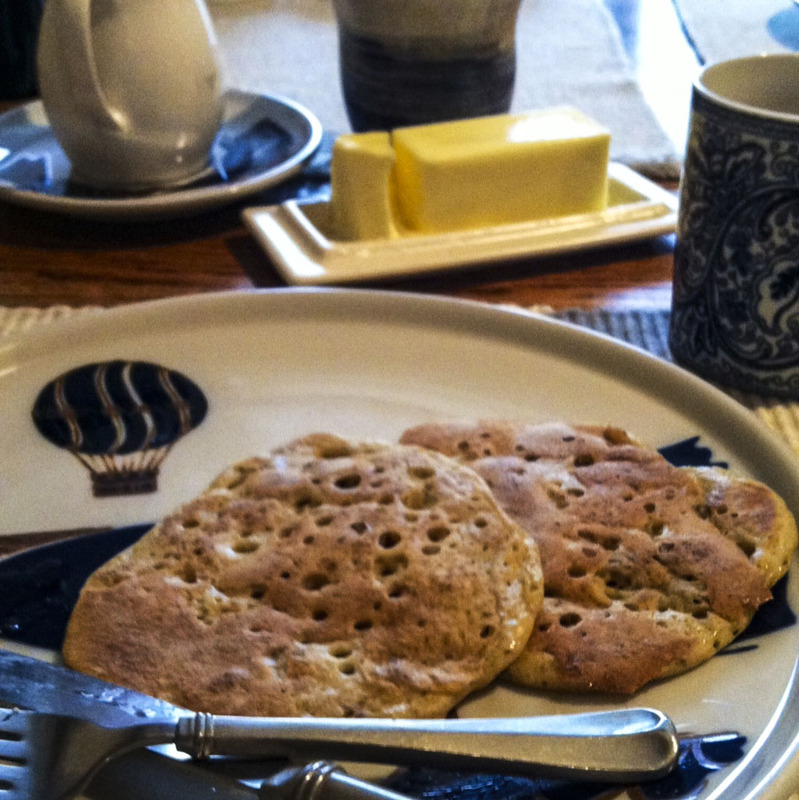 Ahhhhhhh, we nibbled on pancakes for breakfast - orange zest and pecan sourdough pancakes. Don't shrug your shoulders, it was a really big moment marking a turn toward post-flu status, a renewed interest in food, and our first meal together downstairs at the table in ages. I think we've won our separate battles with the flu bug, and are so very ready to find some energy and get moving again. I was relieved to find the sourdough starter had kept bubbling along happily in the fridge all the while we ticked off days/weeks of inactivity, sleeping, napping, and basically moving as little as possible. It (the starter) responded to a routine feeding and overnight rest, then produced lovely light, fluffy pancakes this morning. 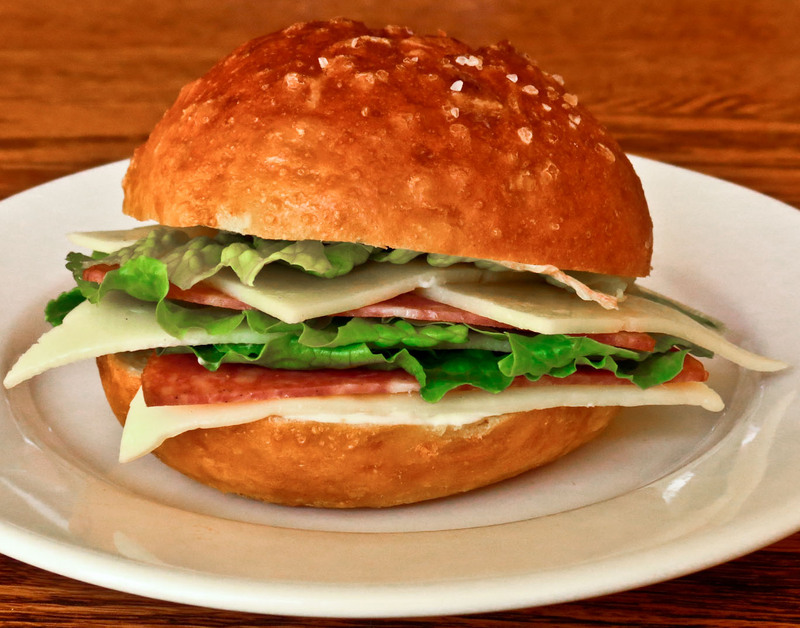 Like a reliable friend, the starter came through when we needed it. This particular starter strain originally came from a King Arthur purchase, replacing an older home-grown, potato-water based batch that had spoiled from neglect. I like to think the new batch has incorporated a variety of wild yeast strains accumulated over years of travel through Canada and Alaska, as well as the many months at home in Seattle. Thinking of building your own sourdough starter? You'll like Donna's step-by-step instructions on Cookistry, a recap of her posts for SeriousEats. 1. Put the starter in mixing bowl; add sugar,salt and egg. Mix well with whisk or wooden spoon. (Various sources caution that sourdough doesn't like metal bowls and utensils, others refute this claim. I'm cautious and go with wood or plastic.) Whisk in the oil. Stir in the pecans and orange zest. Thin with water as needed, depending on starter consistency. 2. Dilute the soda in a tablespoon or two of warm water. You will add the baking soda at the last minute, when you’re almost ready for the batter to hit the griddle. Fold the soda water gently into the sourdough batter. Do not beat it in heavily, you want to encourage the bubble formation, not defeat it. The batter will fill with bubbles and increase in bulk. It's ready when it is fluffier. 3. Preheat the non-stick griddle or pans. Ladle a 1.5 to 2-ounce portion of batter onto a preheated non-stick griddle and cook on side one until bubbles show, and wait until new ones stop forming. Turn and cook on the second side until done and golden brown, or to your taste. (For me that means crispy brown on the outside and soft in the middle.) 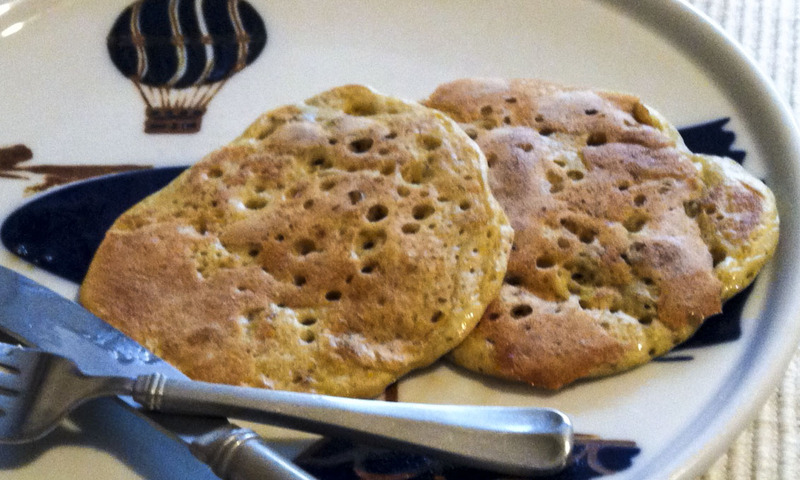 If this first test pancake is too thick, adjust the batter consistency with a bit more water, but don't over do it. Repeat with the remaining batter, stirring the bowl occasionally to keep the batter well-mixed. Crunchy brown sugar and cayenne-dusted bacon or a few rounds of Canadian bacon always make pancakes taste better. 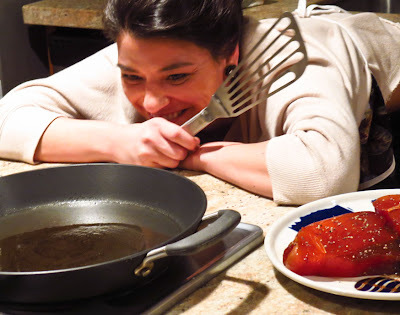 Fruit salsa would be a delicious alternative to butter and syrup for a pancake topper. Pretzels have been floating through my brain lately, real homemade soft pretzels, not the find-in-the-mall kind of pretzels. Plain pretzels, pretzel buns, pretzel bites, pretzel sausages - they all sounded tantalizingly delicious. 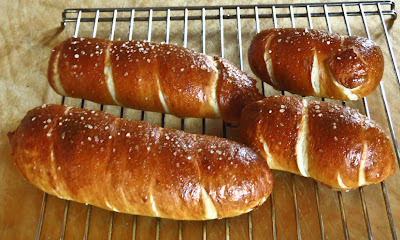 Naturally I did the happy dance when I was assigned Growing up Gabel as my Secret Recipe Club blog for January, and found Camille's recipe for Homemade Boiled Pretzels. I added a touch of onion powder and garlic powder to the dough for extra flavor, and set to work with those recent, recurring pretzel notions. An upcoming Super Bowl game called for easy-to-eat finger food and some substantial snacks ready for the half-time feast or any time-out nibble. 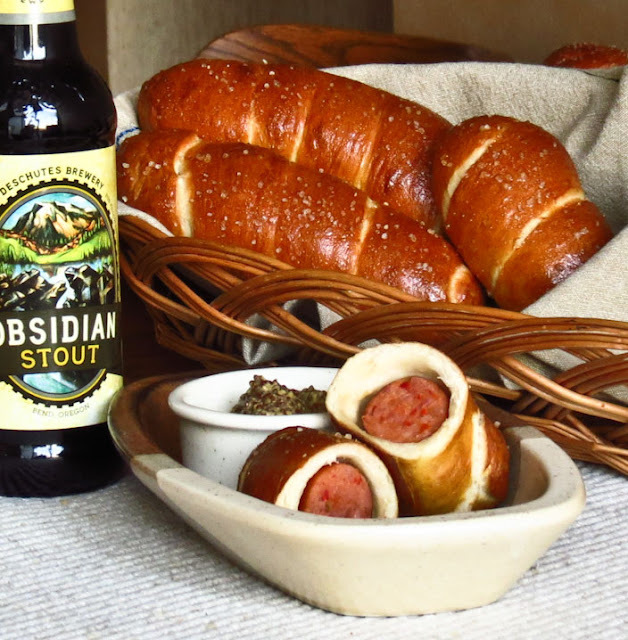 Chili, gumbo or hearty soups are traditional game day fare, but mini pretzel bites, pretzel-wrapped sausages or even pretzel bun sandwiches would be a great addition to the menu. This called for some pre-game practice. That was a good call; a few adjustments were necessary. I began with precooked chorizo sausages, rolled out a few 18 to 24-inch wands of dough, and wrapped these very long strands around whole sausages and a few shorter sausage chunks as well. These meaty packages were boiled in soda-water, drained, egg-washed, salted and baked. Mmmmm, good! 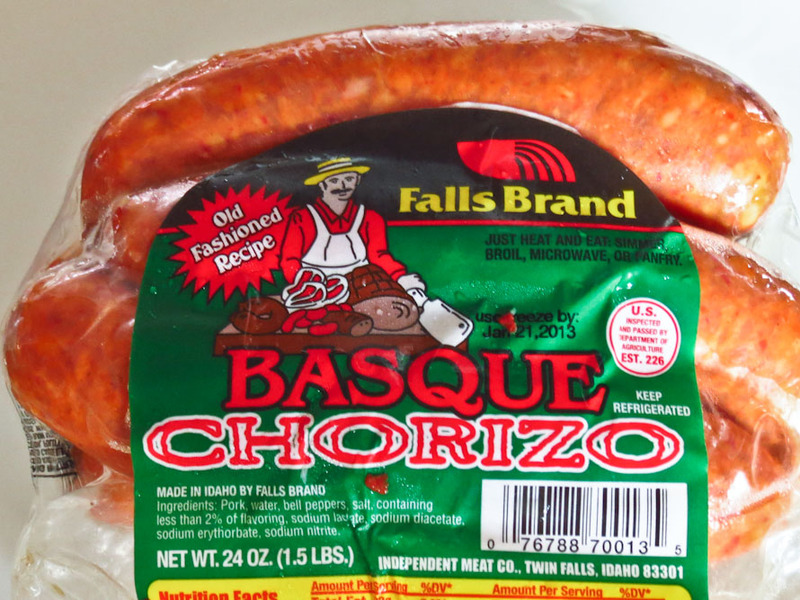 really good, though the oil from the chorizo soaked into the inner surface of the pretzel wrapping. It was tasty, but a little heavy. 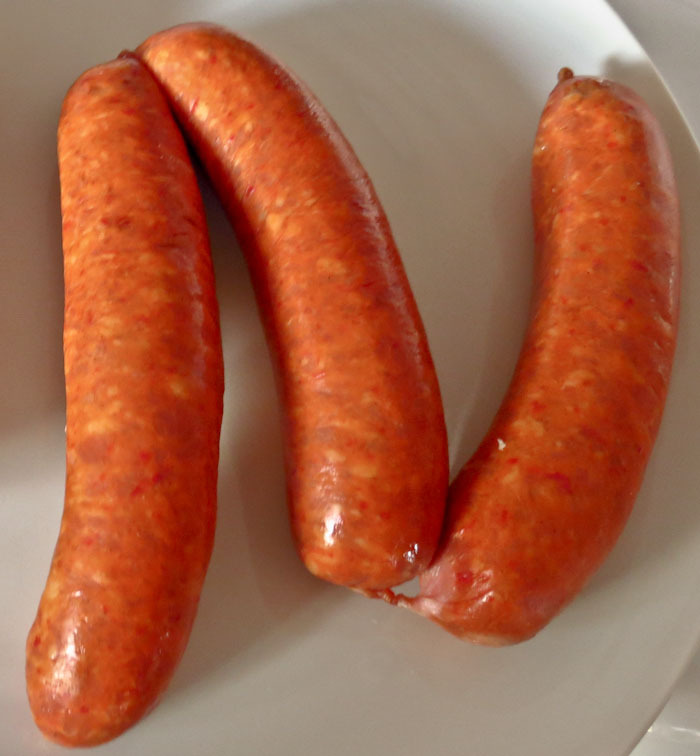 This was more evident with whole sausages than with the shorter sausage chunks. There were no leftovers, but I will choose a less oily sausage for the next batch. 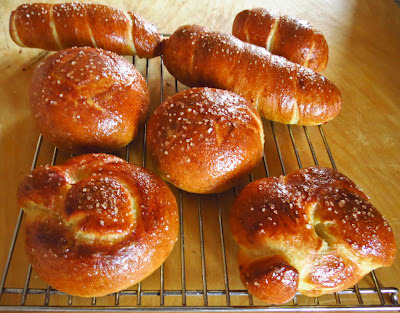 Next came tightly-twisted pretzels and a few rounds of dough which baked into puffy buns. Split in half with the tops slightly scooped out to accommodate fillings, these buns made terrific sandwiches. On game day I'll set out platters of cured meats, cheeses, lettuce, onion rounds and tomatoes with a variety of mustards and horseradish spreads. Pulled pork or BBQ chicken would be other delicious choices as well as cream cheese, lox, capers and pickled red onions. Pretzel buns are such versatile bases, pairing well with almost any filling, though maybe a bit too firm for a perfect ground meat slider. Changes? no changes required, just more practice twisting the pretzels into a more uniform shape. I'm ready to enjoy Super Bowl noshing, even though the Seahawks lost the division match-up to Atlanta. 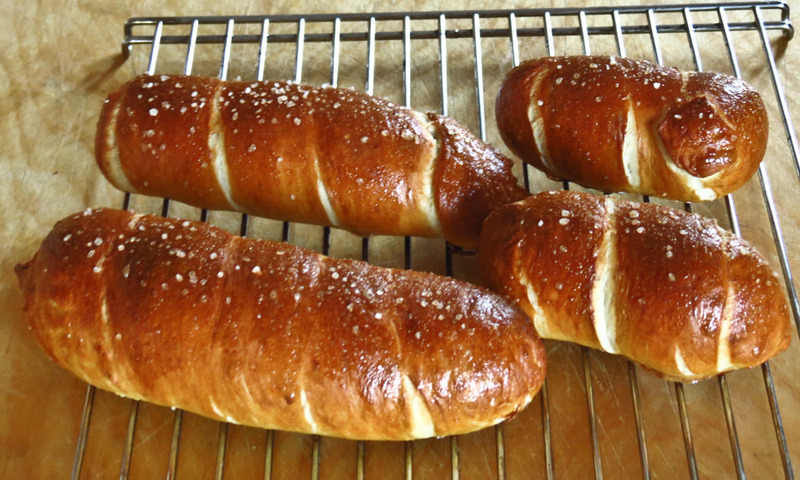 Today's various pretzel snacks were all winners; Homemade Boiled Pretzels are super snack champions. In a large bowl, combine water, yeast, and sugar. Add in oil and salt and 1 more cup of flour. Stir to combine. 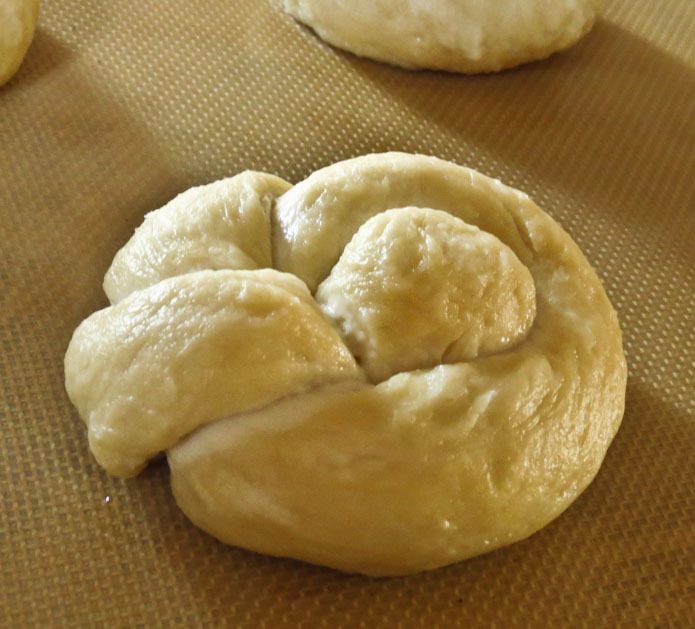 Add enough flour to make a smooth, elastic dough (slightly tacky is fine). Knead dough a few times in the bowl. Cover bowl and let dough rise until doubled (about 1 hour). Pre-heat oven to 475 degrees. Grease baking sheets. Bring the 12 cups of water to a boil in a large stock pot. SLOWLY add in baking soda (it will foam so go slow!!). Keep water simmering. 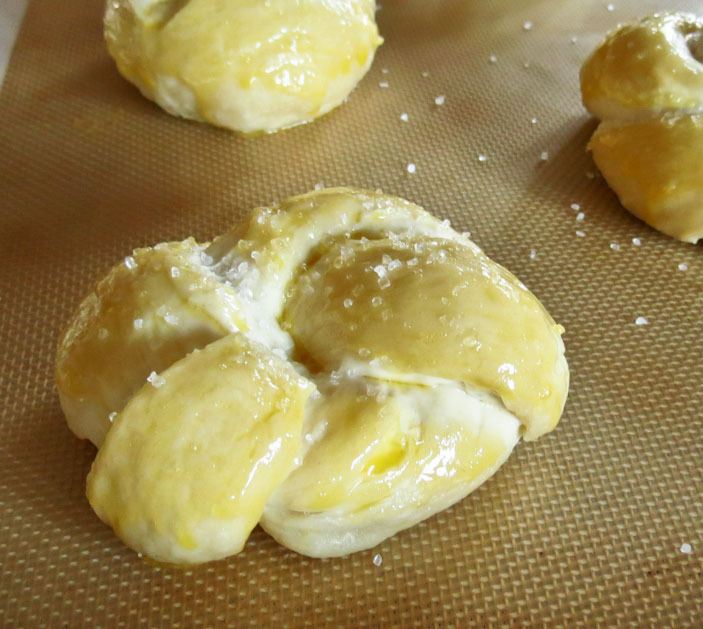 Gently punch down dough and divide in to 6 or 12 pieces (depending on size of pretzel you want). Roll each piece of dough out to an 12-18″ rope. Shape in to pretzel shape and pinch ends to close up. 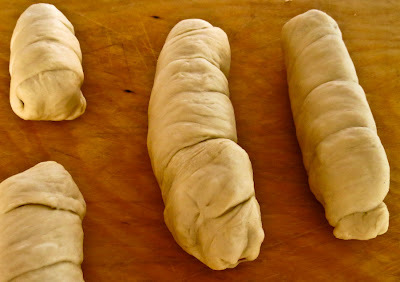 OR, use a dough rope to wrap up a link or smaller piece of sausage, encasing it completely and pinching the ends to secure. Repeat with remaining dough and sausages. 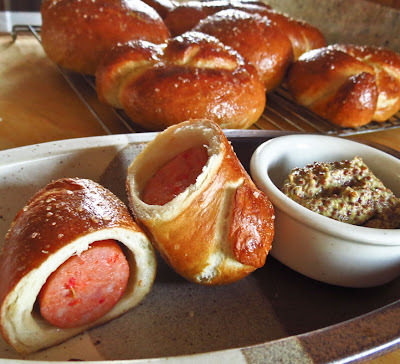 Boil each pretzel for 10-15 seconds, making sure all sides are boiled. Place pretzels on greased baking sheets, 1 inch apart. Cover pretzels and let rest for 5 minutes. Whisk together egg yolk and water and then brush on top of pretzels. Sprinkle salt on pretzels. One day after the cooking class (blog post) we were still focused on fish, ready to recreate our favorite dishes and become totally at ease with the preparation. The slower pace at home was comfortable, and it was fun to shop for ingredients and do our own prep, as well as repeat the steps in the actual cooking process. 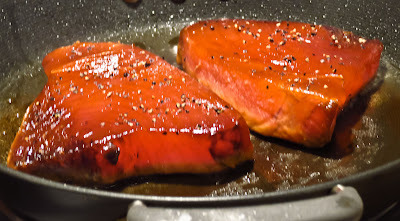 Whisk up a marinade of soy sauce, sesame oil, Sriracha, garlic and ginger; pour marinade into a ziploc bag with the fish steaks and marinate in the fridge for a couple of hours, turning occasionally. 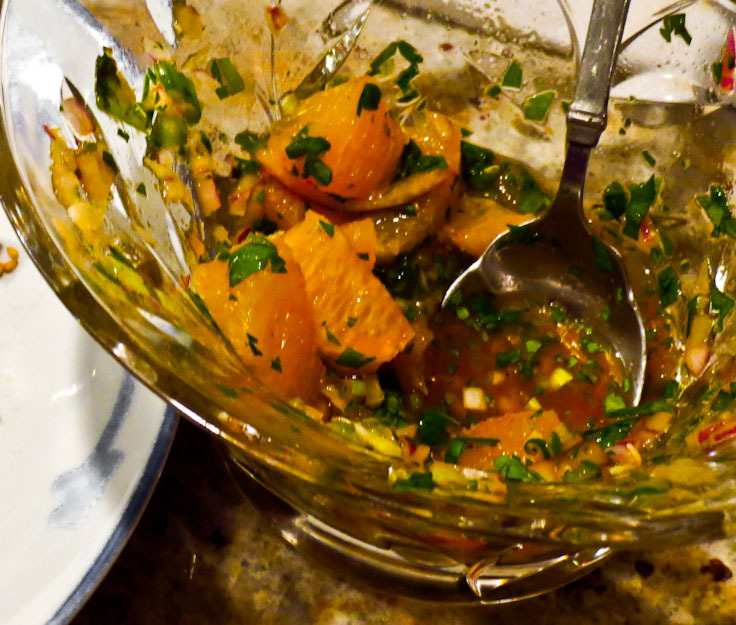 While the tuna steaks marinated we worked on the salsa, mixing together smashed garlic, orange sections, lime juice, red onion, lots of Sriracha, fresh cilantro leaves and a sprinkling of salt and pepper. Sectioning the oranges and cutting them into 1/2-inch chunks produced a lot of juice, and when added to the salsa it contributed to the sweet-sour citrusy tang. All by itself on a tasting spoon, the Sriracha-laced sauce was pretty peppy (okay, it was hot! ), but the heat was tamed balanced later on by the buttery richness of the tuna. I'm sure there's some food chemistry explanation for this effect, but all I can share is the tasting experience. 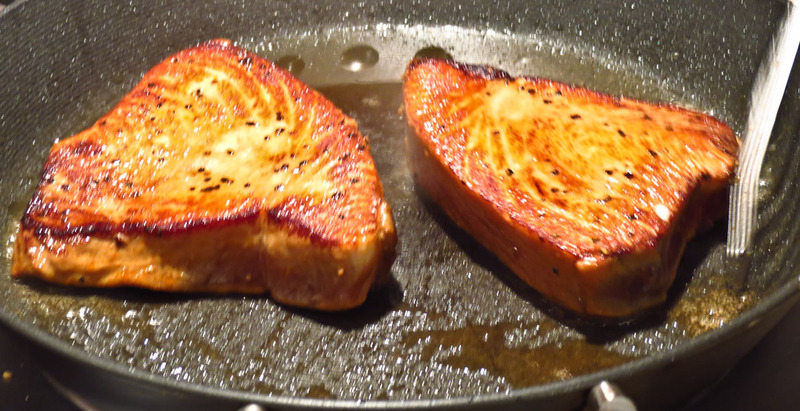 Drain the tuna steaks and season each side with freshly ground pepper. Heat a 2-count of canola oil in a large skillet over medium-high heat and wait for the the surface to shimmer. Here's Hilary watching for that shimmery action. Add the steaks to the pan and sear, about 2 minutes per side for rare (my recommendation) or 3 minutes per side for medium. Use a fish spatula to gently turn the fish, keeping each piece whole in the process. Remove the steaks to a cutting board with a well to catch any juices and tent lightly with foil to keep warm and finish cooking while you prepare the serving platter, or use individual plates. 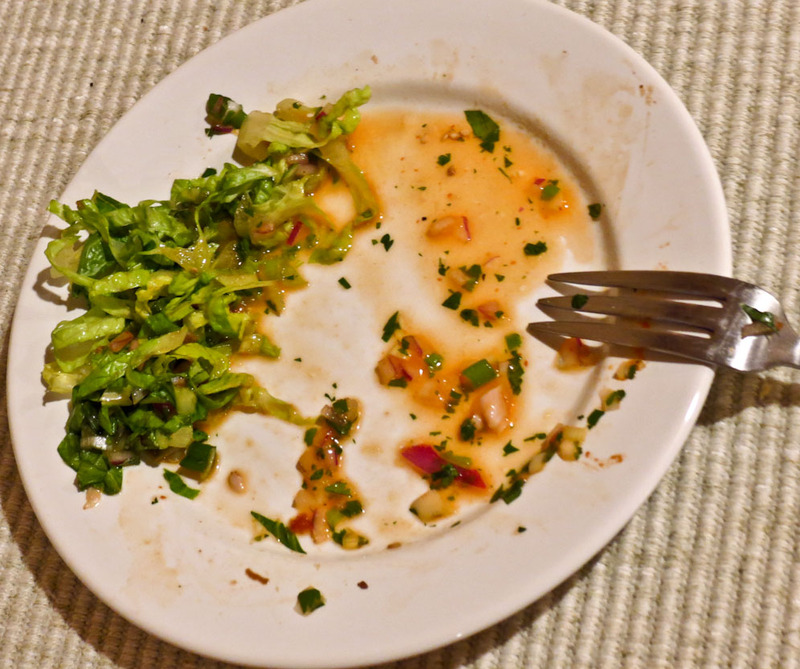 Place salad greens on a large platter or individual plates to use as a bed for the tuna. 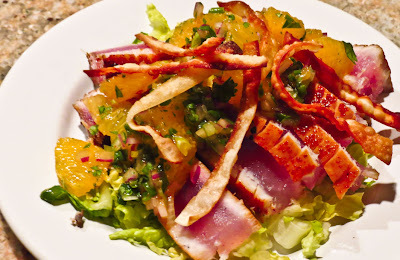 With a very sharp knife, slice the tuna into 1/4-inch thick strips and arrange over the greens. Spoon the salsa on top of the tuna. Garnish with green onions and serve immediately. 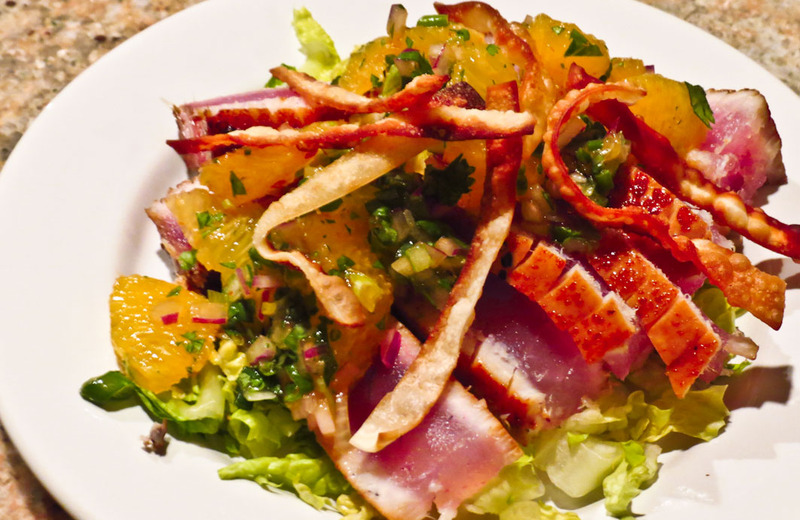 Note: just for fun and added crunch, we topped each serving with crispy fried wonton strips studded with sesame seeds. Was it good? The empty plates tell the story: we loved this Seared Tuna Salad and totally fell in love with the Citrus Sriracha Salsa. 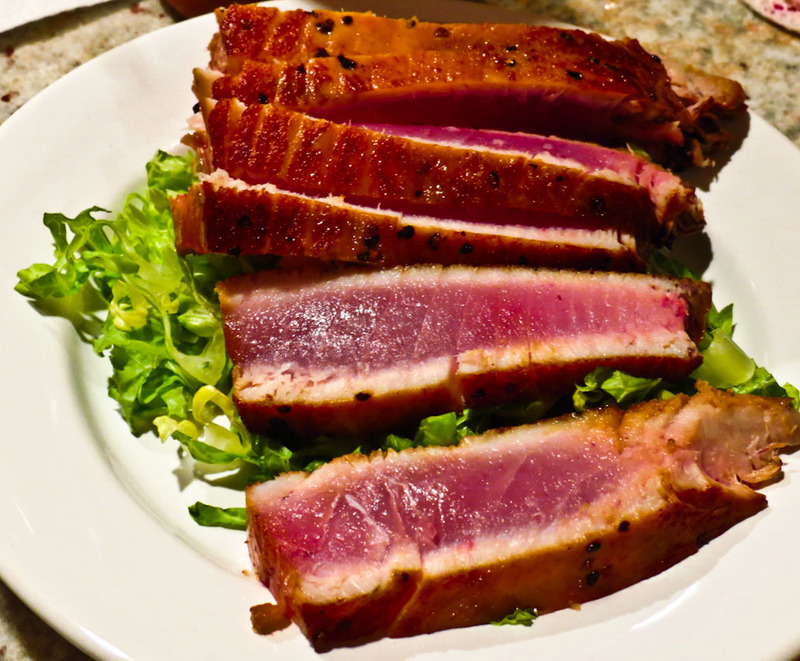 We had planned to serve the Seared Tuna Salad as an appetizer, and only purchased two steaks to serve three people. That amount could have provided lunch-sized servings for four. We managed to eat it all anyway, every bit of it, but did need a break before we worked on the entree later in the evening.